Left: Phoenix LRT in arterial alignment. Right: Houston LRT in street alignment. Photos: L. Henry. Increasingly, interest has been growing in the use of street and arterial roadway rights-of-way (ROW) as alignments for new light rail transit (LRT) segments – either new-start systems or extensions to existing systems. As planners, other professionals, advocates, and civic leaders consider such projects, it’s useful to have reliable data on the installation costs. Unfortunately, many available “average unit cost” methodologies present averages based on various types of alignment — such as re-purposed railroad ROW – rather than exclusively or predominantly street/arterial corridors, which present quite specific needs, challenges, and costs with respect to installation of LRT. For example, while railroad ROWs typically need rehabilitation, much of the necessary preparation for LRT tracklaying is usually in place; space and installations costs for overhead contact system (OCS) infrastructure and stations are often easier to deal with. On the other hand, installing LRT tracks, stations, and electrical systems in streets/arterials typically requires extra (and more costly) tasks such as pavement removal, subsurface utilities relocation, traffic management and reconfiguration, and other measures. The brief study described in this post has been undertaken as an effort toward fulfilling the need for reliable total-system unit cost data for street/arterial LRT project installations. It has focused on predominantly (or exclusively) street/arterial LRT projects, drawing upon data from eight specific projects in five U.S. cities (Salt Lake City, Houston, Portland, Phoenix, and Minneapolis) as listed in the table further below. Also, this study (conducted by LRN technical consultant Lyndon Henry) has endeavored to avoid carelessness as to what is designated as “light rail”. As it has been most pervasively considered since the 1970s, LRT is regarded to be an electrically powered mode, not a light diesel-powered regional railway. For the purposes of this study, LRT has been considered as both electrically powered and operating predominantly in exclusive or reserved alignments (i.e., streetcar-type systems have been excluded). It should be noted that these data have been primarily drawn from Federal Transit Administration resources (particularly New Start profile reports), supplemented where necessary by data from Light Rail Now and Wikipedia. Because these figures present final total capital cost data, they represent final year-of-expenditure costs, including infrastructure and vehicle requirements, and incorporate other typical ancillary cost items such as administration, engineering, contingencies, etc. Capital costs for the eight projects were tabulated as shown in the table below. Portland: Interstate (Yellow) line data include section at outer (northern) end on viaduct over Columbia Slough and flood plain. Phoenix: Initial project data include new LRT bridge over Salt River, and short section on abandoned Creamery Branch of Southern Pacific Railroad. Minneapolis: Green line data include adaptation of roadway bridge over Mississippi River. It should also be recognized that the design requirements and installation costs of streetcar-type LRT projects average significantly lower than those of rapid or interurban-type LRT, particularly because of several factors. For example, streetcar alignments predominantly share street/arterial lanes with existing motor vehicle traffic. Stations often consist of simple “bulge-outs” from adjacent sidewalks, and are typically designed for single-car trains (i.e., single vehicles) rather than multi-car LRT trains. Also, the lighter static and dynamic loading requirements of some streetcar configurations facilitate the use of lower-cost “shallow slab” construction rather than the deeper excavation more typical of “heavier” LRT designs. Data and calculation of average LRT project cost in street/arterial alignments. 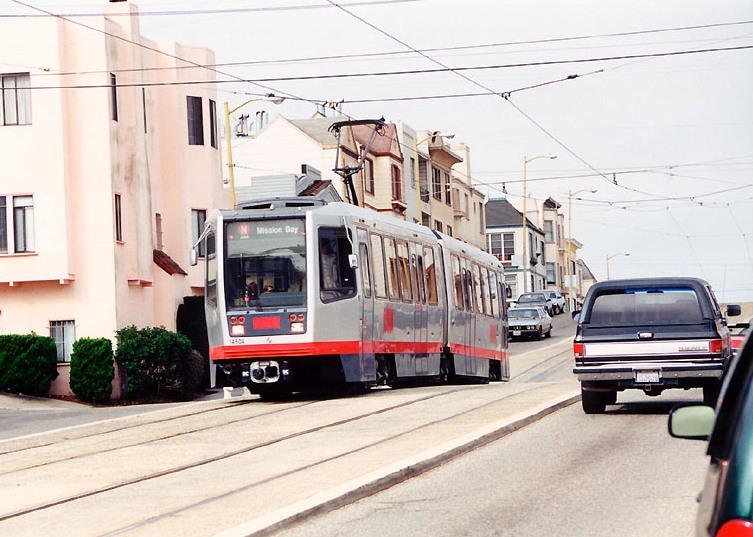 Proposed design for dedicated light rail alignment in Austin’s Guadalupe-Lamar corridor, retaining 4 lanes of traffic, could resemble San Francisco’s Muni Metro N-Judah light rail alignment in Judah St., seen here near 16th Ave. Photo: (copyright) Eric Haas. Annotated map of proposed Guadalupe-Lamar LRT line shows various major activity and population points served, as well as connection to Seaholm-Amtrak site. Map: Austin Rail Now. Cross-section of proposed LRT line, showing dedicated track alignment, 4 lanes of traffic, clearances, and facilities for pedestrians and bicycles. Graphic: ARN. Will a new mayor and a new district-based 10-1 City Council provide an opportunity to scrap this modus operandi of failure and disaster, bring the community into authentic involvement in crucial decisions, and move forward with the first phase of LRT as a starter line in Guadalupe-Lamar? “Plan B” is a 6.8-mile light rail starter line route for Austin’s most central inner-city local corridor. It was originally proposed as a more feasible alternative to the official “urban rail” plan, defeated on Nov. 4th. Map graphic: Austin Rail Now. Austin, Texas — In a somewhat astonishing victory, on November 4th the city’s most dedicated, experienced, and knowledgeable rail transit advocates — including leaders of the Light Rail Now Project — helped defeat an officially sponsored rail transit plan that they said would waste resources on a very weak route and actually set back rail transit development in the community. See: Austin: With flawed “urban rail” plan now on ballot, debate heats up. Produced by a consortium of several public agencies called Project Connect, the official plan — designated “urban rail” but in fact deploying light rail transit (LRT) technology — proposed a 9.5-mile route connecting the declining Highland Mall shopping center on the city’s north side (also a site being developed as a new Austin Community College campus) to the East Riverside corridor in the southeast. While the proposal was projected to have an investment cost of $1.4 billion in 2020, Austin’s City Council placed a $600 million General Obligation bond measure on the ballot as the local share, in hopes that the remainder would be covered by federal grants and other undisclosed sources. It was that bond measure that was defeated, by a 14-point margin, 57%-43% — a stunning triumph for opponents, outspent 2-to-1 by a powerful coalition of the core of Austin’s business and predominantly Democratic political leadership, who also managed to enlist the support of major environmental, liberal, New Urbanist, and other “progressive” leaders. But a coalition of transit advocates and many other community and neighborhood activists otherwise inclined to support rail transit vehemently opposed the plan, objecting to what many perceived as a scheme that ignored crucial mobility needs in deference to real estate development interests. Many community members also felt excluded from what was depicted as a “fraudulent” process that had engendered the proposal. See: The fraudulent “study” behind the misguided Highland-Riverside urban rail plan. With Austin’s most powerful business leadership, mass media, and Democratic Party-dominated political leadership arrayed against them, grassroots rail advocates, community activists, and neighborhood groups opposing the official “urban rail” proposition seemed to face overwhelming odds. Thus defeat of the official “urban rail” plan on Nov. 4th was an amazing upset. Graphic via TheKnowNothingNerd.com. While the defeat of the City’s official plan might be seen as one step back, it could well lead to several steps forward in the form of a new “Plan B” LRT starter line in the central city’s heaviest-travel local corridor, potentially making far more sense to voters and attracting much broader support. This route, original proposed in the 1970s and intensively studied since the 1980s (and very narrowly defeated by less than 1% of voters in a 2000 regional referendum), follows the major arterials North Lamar and Guadalupe Street, serving increasing residential density and commercial activity in the corridor including the West Campus area adjacent to the University of Texas campus, with the third-highest residential density in Texas. Various alternatives for a light rail starter line to serve this corridor are possible; one prominent example is a plan recently proposed by Austin Rail Now (ARN, a coalition of rail supporters including the Light Rail Now Project). As illustrated by the annotated map at the top of this post, this proposal envisions a 6.8-mile line, running from the North Lamar Transit Center (at U.S. 183) to the city’s Core Area (comprising the UT campus, Capitol Complex, and Central Business District). Along the way, it would provide a connection to the MetroRail diesel-multiple-unit-operated regional rail passenger service at the Crestview station (also a major development site), and important the Triangle multi-use development further south. This plan also includes a branch stretching west to a new urban development site located at the former Seaholm electric power plant and current Amtrak intercity train station (at the western edge of the CBD). See: A “Plan B” proposal for a Guadalupe-Lamar alternative urban rail starter line. With 17 stations and a fleet of 30 LRT railcars, ARN’s Plan B is designed to carry daily ridership of as many as 30,000 to 40,000 rider-trips — a figure derived from federally funded studies of the 2000 proposal, and roughly two to three times as much ridership as was likely for the now-defunct Highland-Riverside scheme. Yet, at a projected $586 million, and with no major civil works along the Guadalupe-Lamar corridor, it would have roughly half the investment cost, and an affordability likely to be more appealing to voters. Furthermore, a cost-effective and financially doable starter line located in Austin’s centralmost and most heavily traveled inner-city local corridor could plausibly serve as the central axis or trunk of a far larger citywide LRT system, with lines branching into many other neighborhoods and outlying communities. LRT in Austin’s North Lamar and Guadalupe corridor could resemble Portland’s Yellow Line on Interstate Avenue, shown here. Photo: Peter Ehrlich. Supporters hope that this illustration of a Plan B LRT concept for Guadalupe-Lamar will provide a spark to re-kindle an official rail planning process that truly makes sense. Key to any plan for expansion of transit in Austin is acceptance of the need for re-allocating some street space — and traffic lanes — to dedicated transit use, and this policy is included in the proposal. Tucson’s new Sun Link streetcar passes sidewalk cafe during opening day festivities in July 2014. Photo: Ed Havens. 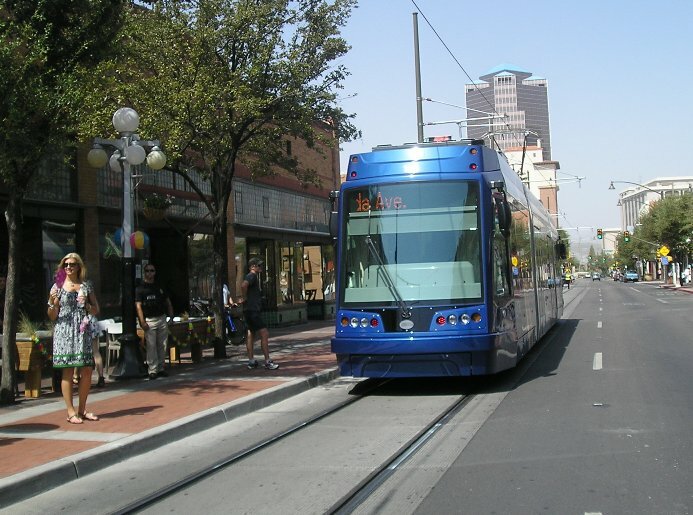 Light rail transit (LRT) continues to sprout across the USA, driven especially by the lower cost and easier implementation of streetcar-type LRT technology. 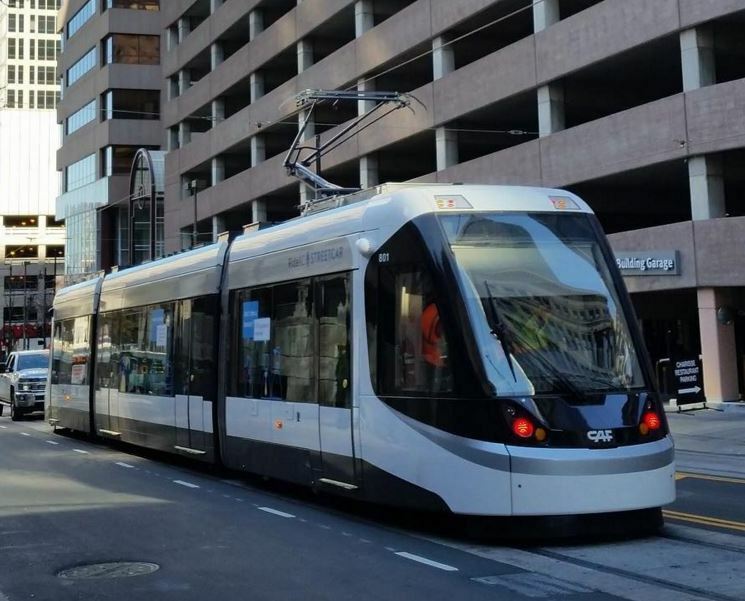 Listed below are several U.S. cities where new streetcar systems either have recently opened, or projects are under way, bringing the first rail transit in the modern era to these metro areas. 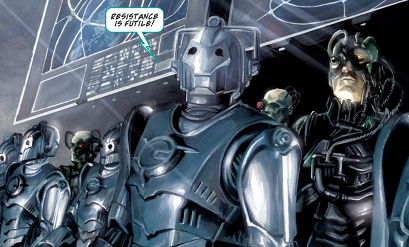 Links to helpful articles providing further information are provided, as available. This medium-sized Arizona city’s 3.9-mile streetcar line, branded Sun Link, opened this past July, at an investment cost of $198.8 million. The starter line route links up the University of Arizona campus with important activity points like Main Gate Square, the Fourth Avenue business district, and downtown Tucson, continuing westward to the Mercado area west of Interstate 10. Ridership (averaging over 4,700 on weekdays) has already surpassed projections. See: Tucson Sun Link streetcar opens, meets ridership goal. This midwestern city’s streetcar project, now in the advanced stages of construction, will install a 3.6-mile loop (1.8 miles of route from one end to the other) in the CBD. The $133 million starter line will stretch from The Banks to Findlay Market, and is projected to open for service in the fall of 2016. See: CincyStreetcar Blog. This 2.2-mile starter streetcar line will operate mostly along Main Street through the CBD, connecting River Market with Union Station. Budgeted at $102 million in 2012, the project is well under way. Construction began in May 2014, and the line is expected to open for passenger service in late 2015. See: Kansas City — Another new downtown streetcar project starts to take shape. A 4.6-mile streetcar starter line, now in advanced planning, will bring rail transit to this major city. The project, currently estimated to cost $128.8 million, will circulate through the CBD, and will feature wireless operation beneath the BNSF Railway overpass linking the city’s MidTown area with the historic and adjoining Bricktown district. Opening is projected for late 2017 or early 2018. See: Oklahoma City Rail Transit and Public Transport Developments. The City has a 2.1-mile streetcar starter line project under way with a budgeted investment cost of $64.6 million. Extending from Ogden & Prospect on the northeast of the CBD to 4th & Wisconsin, completion has been targeted for 2016. However, the City may have to find an additional $20 million to cover the cost of utilities relocation, under a recent ruling by the Wisconsin Public Service Commission. See: Milwaukee aiming to start streetcar line construction in 2014. Project Connect’s 9.5-mile, $1.4 billion urban rail (light rail transit) proposal is opposed by the staunchest and most knowledgeable rail transit proponents in Austin. Map: Project Connect. Austin, Texas — For months, this city’s staunchest and most knowledgeable rail transit advocates, including the Light Rail Now Project team, have been leading the criticism of an “urban rail” (light rail transit) plan being proposed by Project Connect, a consortium of several public entities, including the City of Austin, the Capital Metropolitan Transportation Authority (Capital Metro), and the Capital Area Metropolitan Planning Organization (CAMPO). A central focus of most of this criticism has been the fact that the proposed route fails to serve the city’s premier central corridor, identified as Guadalupe-Lamar because it follows two major arterial roadways by those names. Project Connect’s route, a meandering 9.5-mile alignment now priced at roughly $1.4 billion (2020 dollars), instead seems to try to create a new corridor from a southeastern area known as the East Riverside corridor, across the Colorado River and north through the east side of the CBD, through the East Campus of the University of Texas, and through a somewhat convoluted connection to a declining shopping mall site, known as Highland Mall, now being transformed into a new Highland campus for Austin Community College (ACC). 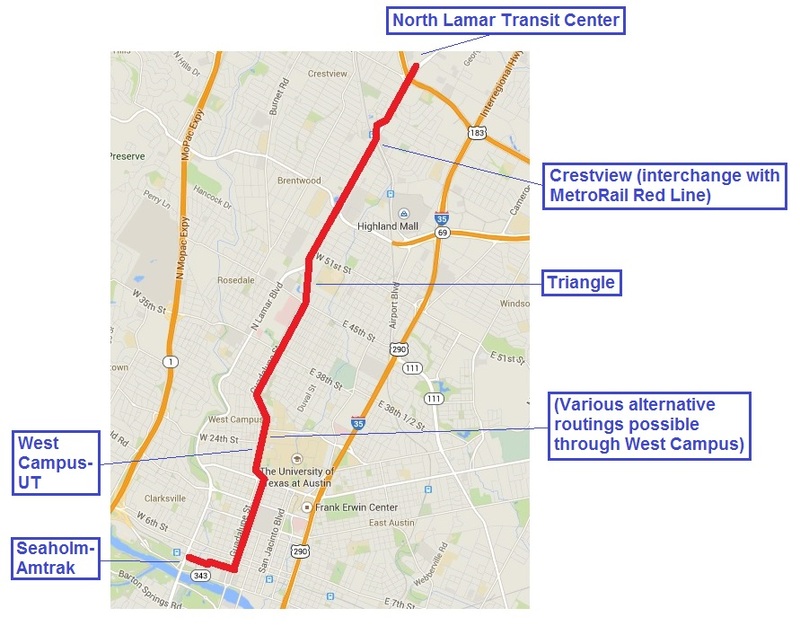 However, at a staggeringly high cost, the proposed line fails to solve critical mobility needs, misses the major local travel corridor of the central city (Guadalupe-Lamar), and misses the high-density West Campus neighborhood area. Rail proponents also warn that, by “soaking up all the oxygen” (available financial resources), the project would seriously constrain further rail development and extensions throughout the city. 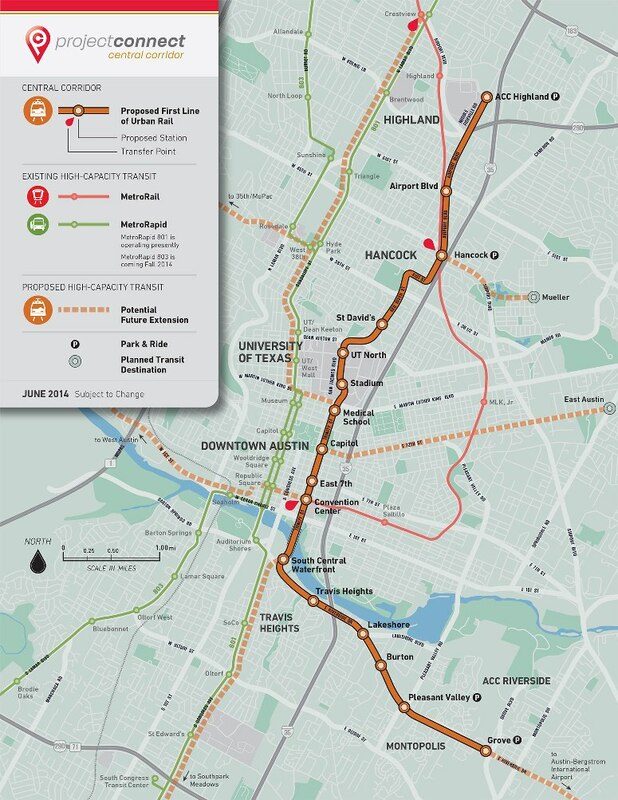 Furthermore, the dubious urban rail plan (driven more by desires of real estate developers than by mobility needs) also seems linked to a plan to entrench the MetroRapid bus operation (portrayed as “bus rapid transit”) in the Guadalupe-Lamar corridor, where it would likely become a barrier to urban rail development there. On June 26th, the Austin City Council designated the Project Connect plan as the city’s Locally Preferred Alternative (LPA), and on August 7th the Council authorized a ballot measure that asks voters to approve $600 million in general obligation bonds to pay for a local portion of the proposed urban rail project. The ballot language stipulates that bonds could only be issued if the City finds an additional $400 million in funding for an array of roadway projects, including roadwork on Interstate 35 running through the city. • Project Connect’s “corridor” study — without corridors! • What’s with Project Connect’s “2.9 million daily ridership” projection? • Will Project Connect continue to gag the public? • Project Connect’s urban rail forecasting methodology — Inflating ridership with “fudge factor”? • Reality Check: How plausible are Project Connect’s time/speed claims for Highland-Riverside urban rail plan? • West Campus is where the students are! This article has been updated to reflect a revision of the LRN study described. 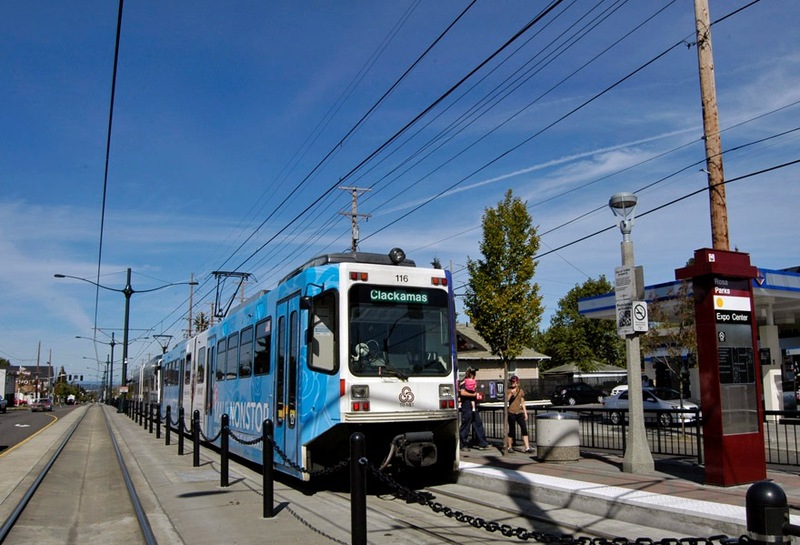 The study was revised to include Salt Lake City’s TRAX light rail starter line, which was opened in late 1999. What’s been the been cost per mile of new U.S. light rail transit (LRT) “starter systems” installed in recent years? Major data sources have included TRB/APTA 8th Joint Conference on Light Rail Transit (2000), individual LRN articles, and Wikipedia. • Seattle — While Seattle’s Link LRT is by far the priciest system in this comparison, there are explanatory factors. Extensive modification of existing Downtown Seattle Transit Tunnel (and several stations) previously used exclusively by buses; tunneling through a major hill, and installation of a new underground station; extensive elevated construction to negotiate hilly terrain, major highways, etc. • Dallas — This starter system’s costs were pushed up by a long tunnel beneath the North Central Expressway (installed in conjunction with an ongoing freeway upgrade), a subway station, a new viaduct over the Trinity River floodplain, and significant elevated construction. • Los Angeles — The Blue Line starter system included a downtown subway station interface with the Red Line metro and a short section of subway before reaching the surface of proceed as street trackage and then open ballasted track on a railroad right-of-way. • St. Louis — While this system’s costs were minmimized by predominant use of former railroad right-of-way, a downtown freight rail tunnel was rehabilitated to accommodate the system’s double-track LRT line, with stations; an existing bridge over the Mississippi River was adapted; and significant elevated facilities were installed for access to the metro area’s main airport.